Did you know that the Asgard pokie is the star of Fair Go Casino’s Game of the Month promotion? Yes, your favourite online pokie could earn you complimentary points for the month of August! So, why spin the reels anywhere when you could play at Fair Go Casino and earn proper rewards. Check out the details below and a brief review of the featured online pokie – Asgard. From the creative engines at Real Time Gaming comes Norse-themed Asgard online pokie. The Norse-theme made undeniably popular by Marvel and its record-breaking movies like Avengers and Thor. So, it makes complete sense why RTG would capitalise on this successful theme. 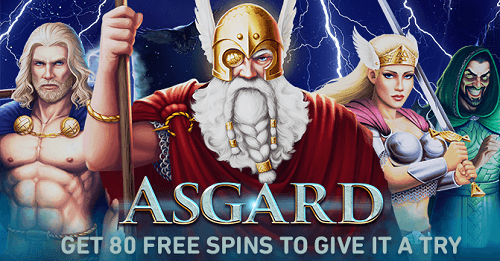 Join Thor and Odin in their Asgardian adventures when you spin the reels of Asgard. The pokie has 243 ways to win and features a hero’s bonus feature. In addition, the pokie upholds RTG’s high-level gaming with exquisite graphics and an engaging soundtrack. Asgard is a medium variance pokie with a payout of 96%. Now that you know a bit about the online pokie spin the reels on the Asgard pokie and make your gold this August. Fair Go Casino’s Game of the Month promotion gives you the opportunity to win big. When you play Asgard, you will earn double complementary points. You can exchange the comp points for real money; 100 comp points equal AU$1. Use the bonus code – GOTM1808 to activate this promotion. Please note that this bonus is only valid for the month of August and only available on the Asgard pokie. New to Fair Go Casino? No worries – read our casino review, sign up and claim your welcome bonus of AU$1000 today!